It is finally official. The proposed barrage at Bharbhut, which is to be built for Rs 4,000 crore on the mouth of Narmada river, and for whom an environmental public hearing is expected to take place on July 19 in Bharuch district, is slated to serve the corporate houses, who have heavily invested in the Bharuch-Dahej region. This is clear from the data provided by the state-sponsored report, "Environmental Impact and Risk Assessment for the Proposed Barrage Across River Narmada near Bhadbhut, Dist. Bharuch", by top consulting firm National Environmental Engineering Research Institute. The study, which which has just been released, says, fresh river water availability for domestic usage will be 60 million cubic metres (MCM), for irrigation it will be 10 MCM which will be mainly "for revival of defunct lift irrigation schemes of the area" for irrigating a command area of just 1,136 hectares (ha) area, and for "industrial purposes" it will be a whopping 200 MCM to "facilitate speedier infrastructure development of the region." The areas that would need to be covered for irrigation are "two defunct minor lift irrigation schemes namely Angareshwar LI scheme (568 ha) and Zanor LI scheme (568 ha) having total command area of 1136 ha. 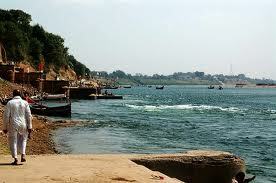 These schemes will be revived by the water storage at the proposed Bharbhut barrage project." Of this, Kharif area is 675 ha and and Rabi area is 345 ha. Importantly, for lifting water, the farmers would have to shell out money from their pocket. The study makes it clear, "The water is to be lifted by the farmers at their own cost. Also, no canal system is envisaged and hence seepage from canal is ruled out." Significantly, the total agricultural area of the district is 3,30,302 ha. The crops which are irrigated are paddy, Jowar, tur, udad, groundnut, maize, soyabean in the in Kharif season covering an area of about 2,80,000 ha. The crops like wheat, grams, vegetables are sown in Rabi season in an area of 80,000 ha.Because of salinity ingress, productivity in the region is low. The state "expects" productivity to go up once the barrage is constructed and fresh water is stored in the area between the Narmada dam and the barrage. The justification for giving huge such amount of water to the corporate sector, including the upcoming Petroleum, Chemical and Petrochemical Investment Region (PCPIR), Dahaj, which includes a special economic zone, too, is that it would "earn" the state revenue. The study says, "As it is proposed to undertake the construction and operation of the proposed project on private public partnership (PPP) mode, revenue generation from the sale of water to industries is assessed at Rs 300 crores at the start and at Rs 500 crore" later. The study seeks to explain, the "gross storage is about 500 MCM, and the "the reservoir water is planned to be utilised for domestic, industrial and irrigation purposes." Explaining the reason for not giving much water for irrigation, it says, "The agricultural area on both the banks of the river, except area at higher elevation along the bank, are having irrigation facility through Ukai Right bank Canal system on left bank of Narmada river and Narmada Canal system on right bank."